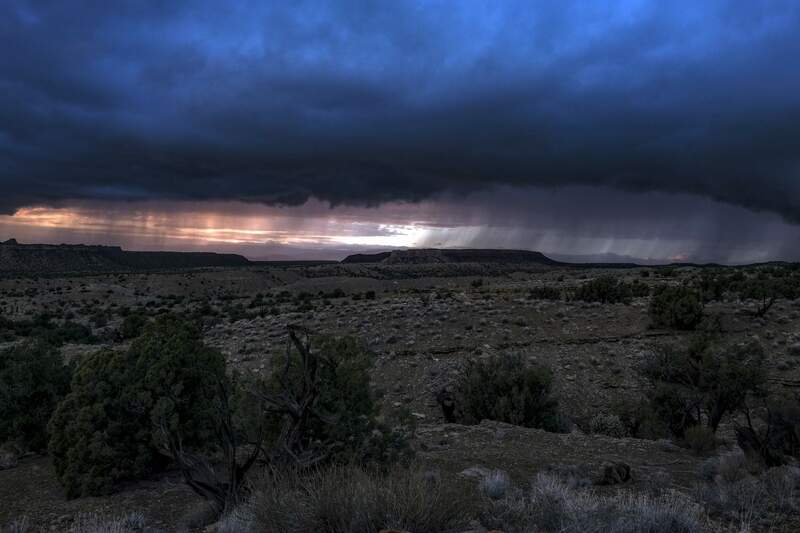 Cloud cover and rainfall in the Circle Cliffs region, an area removed from Grand Staircase-Escalante National Monument, in Garfield County, Utah. 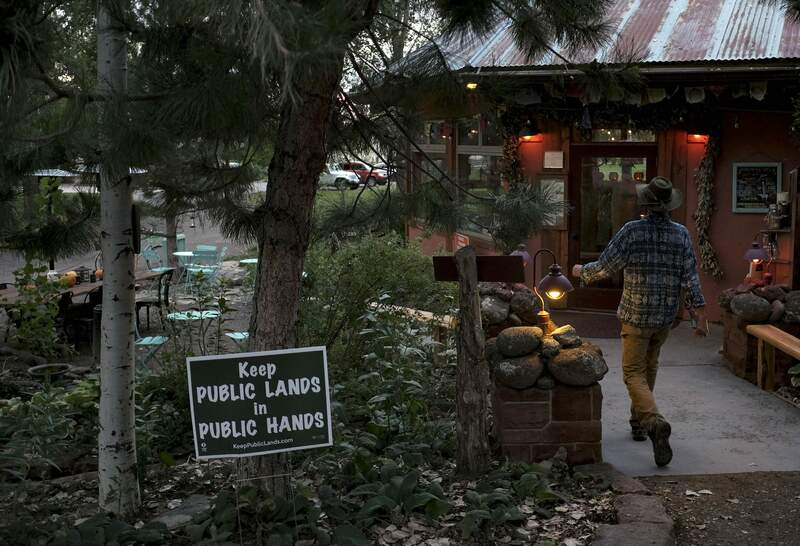 A sign supporting Grand Staircase-Escalante National Monument at entrance of Hell’s Backbone Grill & Farm in Boulder, Utah. Panorama of the landscape just south of Colt Mesa in the Circle Cliffs region, an area removed from Grand Staircase-Escalante National Monument in Garfield County, Utah. 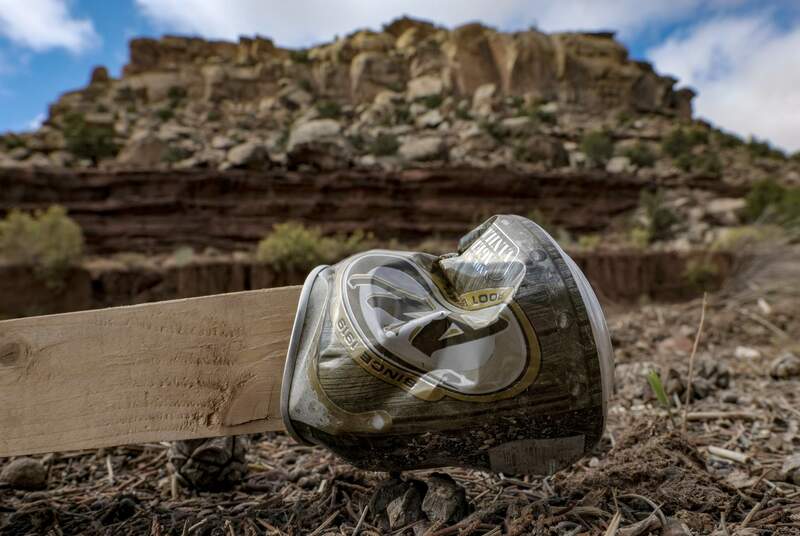 Colt Mesa is one of 18 sites with mining claims that are staked on ground that was removed from the Grand Staircase-Escalante National Monument in Utah. Panorama of the landscape in the Circle Cliffs region, an area removed from Grand Staircase-Escalante National Monument, in Garfield County, Utah. ESCALANTE, Utah – On the eastern end of Grand Staircase-Escalante National Monument, narrow slot canyons shoot through the rocks in shades of terra-cotta red and pale peach. To the west stand surreal rock spires, the hoodoos for which the badlands are known. But what’s buried beneath undulating gray formations here is what caught Washington’s attention: coal. Most public lands battles play out with a predictable script: An industry wants something and environmentalists resist. But in the case of President Donald Trump’s decision to scale back protections in this patch of southern Utah, the battleground has shifted. 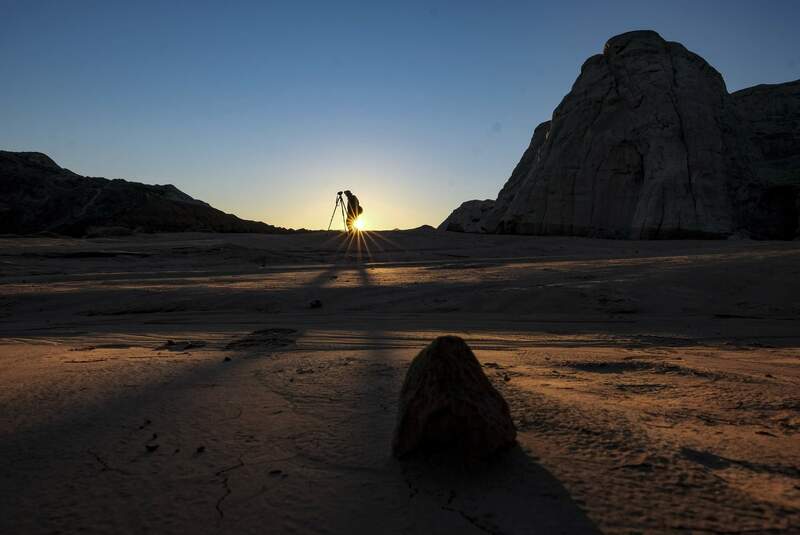 Anton Foltin of Tucson, Ariz., photographs the Toadstool Hoodoos in an area that was removed from Grand Staircase-Escalante National Monument in Utah. “They don’t know your land and, truly, they don’t care for your land like you do,” the president declared. In fact, the monuments’ new boundaries were drawn by political appointees stationed in Washington. They were based on input from not just Utah officials, but also lobbyists in the energy industry and others. According to two individuals involved in the decision, both of whom asked for anonymity to discuss White House deliberations, Trump was focused on striking a blow to his Democratic predecessors. 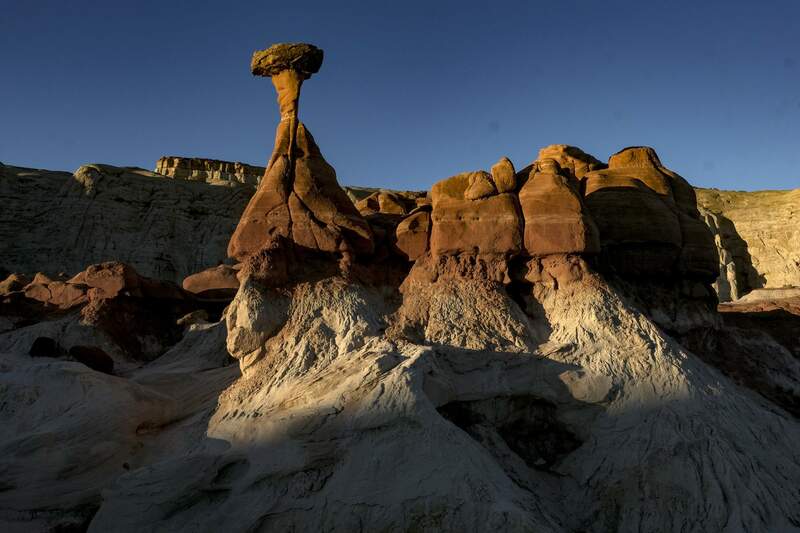 The Toadstool Hoodoos in Kanab, Utah, stand in an area that was removed from Grand Staircase-Escalante. Challenging economicsThe abandoned, weathered cart is perched on a slope leading to an ore chute that’s been idle since the 1970s – a sign of how long it’s been since mining companies operated here. But now this site is one of at least 18 active claims – with names like Mesa and Vulcan and Berry Patch – staked on ground that was removed from the monument. Taking advantage of a 146-year-old law, prospectors can pay a $212 filing fee and $155 annual maintenance fee for the right to extract cobalt, copper and other minerals buried underground without paying federal royalties. The Utah Geological Survey recently conducted an assessment of the metallic minerals – along with the tar sands, coal, oil and gas – for BLM as part of the planning process. Asked about prospects for mining these materials, the survey’s energy and minerals program manager was skeptical. “It’s fair to say that all of them are small, low grade and the economics of any development would be significantly challenging,” said Michael Vanden Berg. 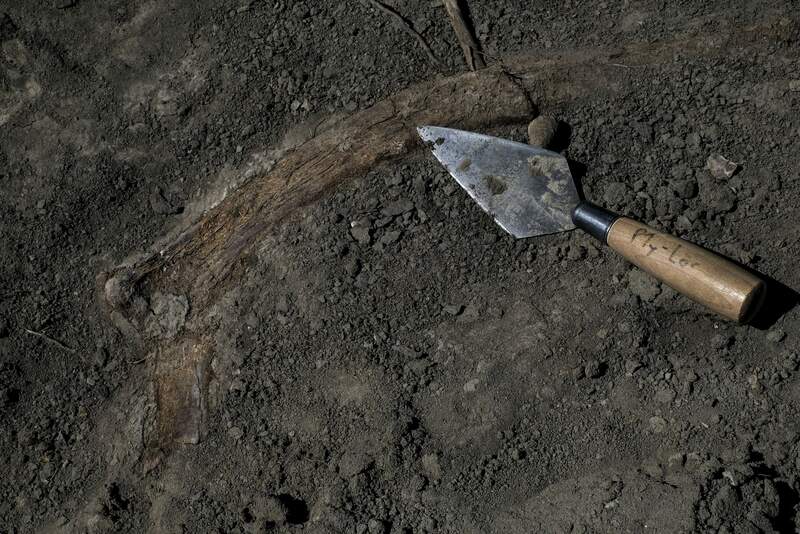 A portion of a rib of the duck-billed dinosaur hadrosaurid was found in Grand Staircase-Escalante in Utah in October 2018. Scientists continue to discover new species of dinosaurs there. 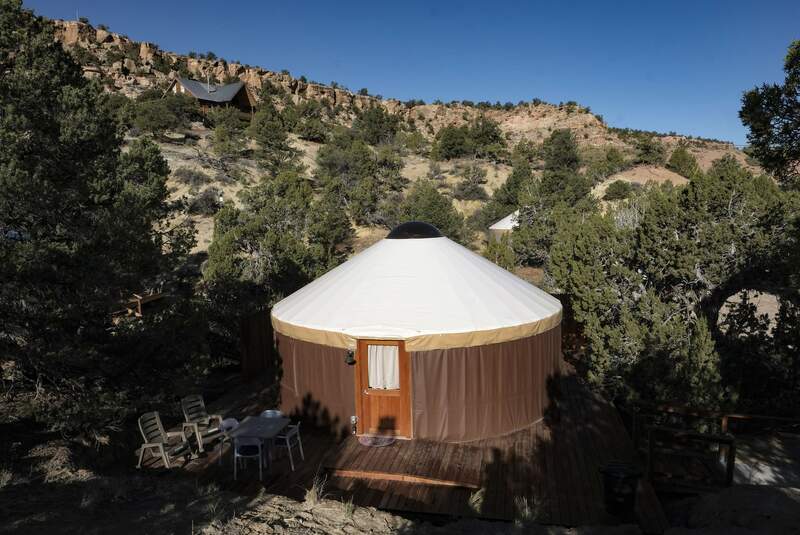 One of several yurts at Escalante Yurts in Escalante, Utah. Monument designation angered localsIn the mid-1990s, Andalex Resources had finalized plans for its Smoky Hollow mine on the Kaiparowits Plateau. It planned to extract 248 million tons of coal over the course of 35 years. PacifiCorp also held leases, as did a smattering of oil and gas firms. But the companies didn’t know that Clinton and his top aides had launched a secretive process in July 1996 to scuttle all of those plans. After the president issued an unsuccessful veto threat aimed at halting energy exploration in the area, his staffer Katie McGinty turned to the 1906 Antiquities Act – a law that gave the president broad, unilateral authority to protect federal lands facing imminent danger. She tasked Interior’s solicitor, John Leshy, with drawing up the maps and convening experts from different agencies to work out details of the proclamation: At one point, someone brought in a copy of Car and Driver magazine that featured a cover story on the most remote area in the Lower 48, which was the farthest from a paved road in every direction. It lay in the heart of what became Grand Staircase-Escalante. Clinton’s Sept. 18, 1996, designation of the monument – made from the south rim of the Grand Canyon, miles away from the actual site – infuriated many locals, who saw it as undermining their livelihoods. Gladys LeFevre, a Boulder Town Council member, said it was an act of vanity. “I’m not a fan of Bill Clinton,” she said. A fallen stake marks a claim on the Colt Mesa parcel, which, until 2018, was within the boundary of Grand Staircase-Escalante National Monument in Utah. Canadian company Glacier Lake Resources has claimed mining rights on the mesa. Some Utah residents – especially local ranchers – welcome the changes. Interior’s draft plan would make about 66,000 more acres available for grazing. The plan would open areas around the Escalante River, where conservationists had bought out ranching permits 20 years ago. Croft’s group, which raised and spent $10 million for restoration along the Escalante River, is part of the community’s pivot to tourism. While its neighboring National Park Service sites – Bryce Canyon, Capitol Reef and Glen Canyon – attract more tourists, Grand Staircase-Escalante’s wild nature has a dedicated following. Visits rose nearly 63 percent over the past decade, to almost 1.2 million visitors in fiscal 2018. 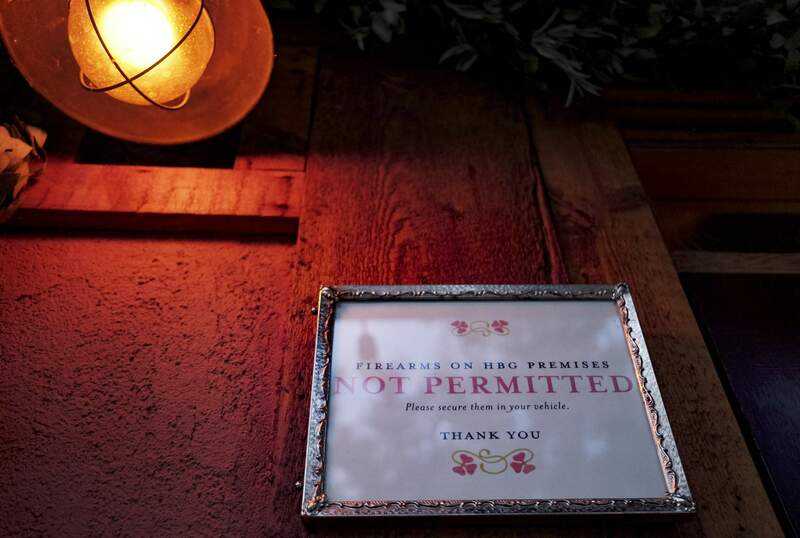 A sign at the entrance of Hell’s Backbone Grill & Farm in Boulder, Utah. 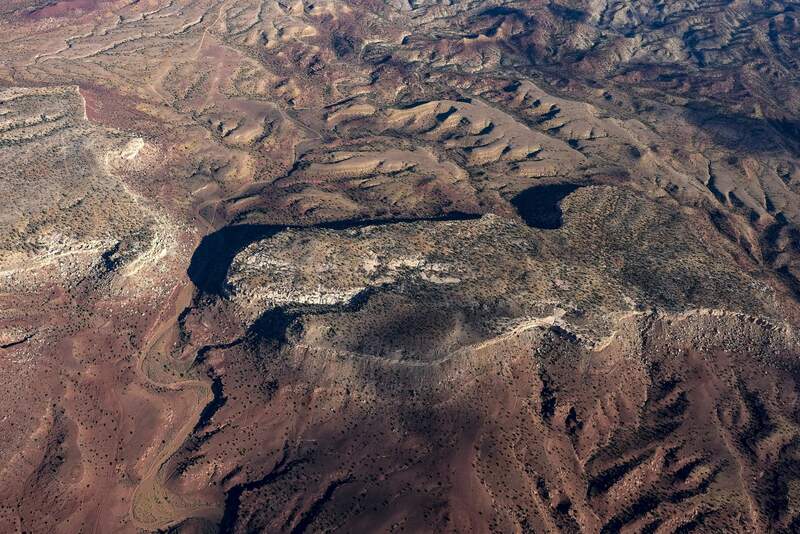 An aerial view of Colt Mesa in Garfield County, Utah. The mesa is part of the Circle Cliffs region that was removed from Grand Staircase-Escalante National Monument. Link to dinosaursMore than anything, what makes Grand Staircase-Escalante exceptional is that it provides a nearly complete snapshot of the Late Cretaceous Period – from roughly 95 million to 74 million years ago – right before volcanic eruptions and an asteroid impact triggered climate change and a massive extinction event. At that time, it was more like the Louisiana bayou than the arid territory that it is today, with coniferous trees and flowing rivers that deposited sediment and trapped organisms quickly during floods. In the early 1980s, paleontologist Jeff Eaton began searching here for evidence of small mammals – tiny teeth, along with pieces of frogs and lizards – to date the rocks. He unearthed an entire ecosystem. 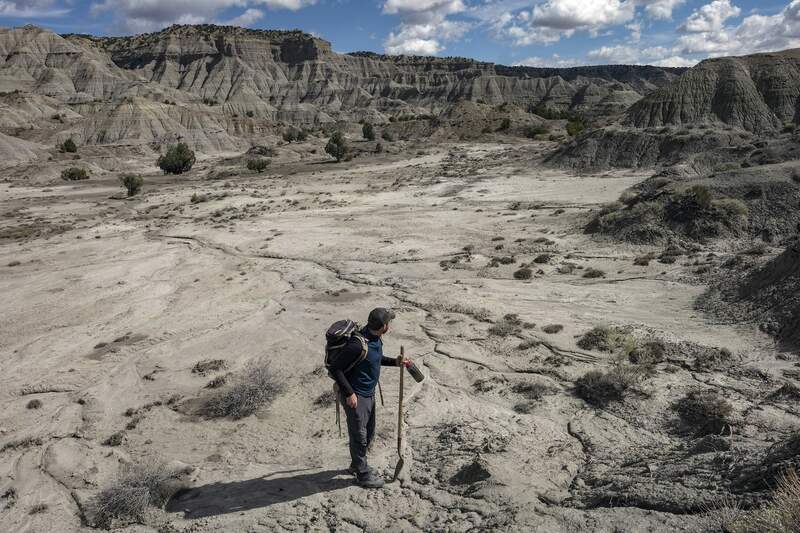 Paleontologist Randy Irmis makes his way to a newly discovered dinosaur site in Grand Staircase-Escalante National Monument. Under Trump’s proclamation, however, two of the ancient rock layers that once lay within the monument’s boundaries – the Tropic Shale and Straight Cliffs Formation – are almost entirely cut out. The draft management plan will allow for “casual” fossil collection in areas that are outside the reconfigured boundaries, and for a small amount inside the monument. Titus said that the BLM has identified two places that were areas of historic fossil collecting before the 1990s. Titus said this activity will not deplete fossils that matter for scientific research.